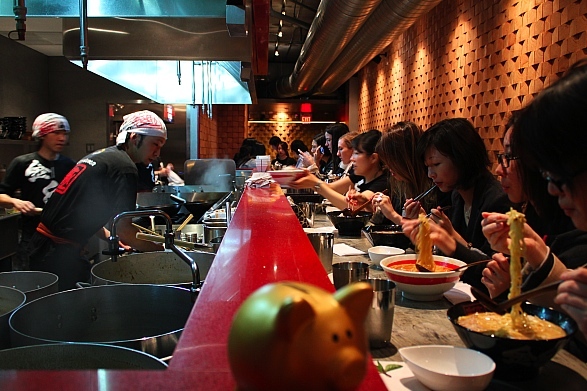 Kinton Ramen opened in Baldwin Village last month, upping Toronto's noodle ante, a food trend that's been all the rage in New York City for a few years now. With David Chang of Momofuko fame set to open shop in Toronto at the end of July, this city's ramen scene is likely in for a serious shake up. If Chang's Toronto spots live up to his reputation, will Kinton be relegated to second fiddle? The latest restaurant from the owners of Guu Izakaya and Guu Sakabar , Kinton doesn't seem to have much to worry about, as it's been packed since opening. 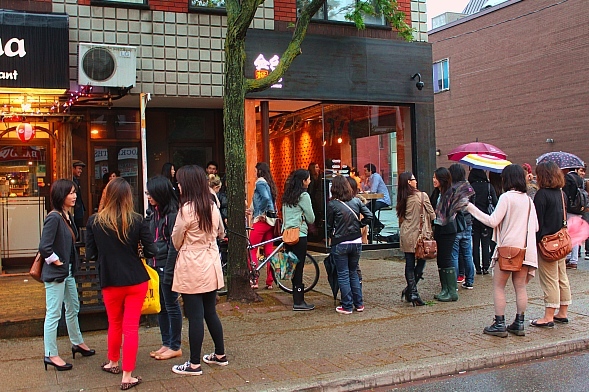 On the night of my visit, it's pouring rain but that doesn't deter the crowd assembled out front for the 45 minute wait (unsurprisingly, there are no reservations here). As with the Guu restaurants, Kinton's staff hollers out enthusiastic greetings in Japanese as guests enter, setting a friendly vibe before we've even sat down. We take a seat along the bar facing the line of frenetic and hustling kitchen staff who are labouring over huge vats of noodles in boiling water and pots of ochre-coloured soup stock. Hip hop blasts through the restaurant, lending upbeat energy to the already fast-paced environment. The rich, meaty smells wafting up from the open kitchen has us excited and hungry. Some of that excitement wanes when we learn that despite having a selection of Japanese beers printed on the menu, the restaurant isn't actually licensed yet â egregious false advertising, I would say. Settling for glasses of water in lieu of Sapporo, we contemplate the mains. Seeing the enormous portions at the tables around us, we decide to forego appetizers in order to save room for the big noodle bowls. But when our food arrives, we find ourselves underwhelmed. The noodles are a little undercooked and each dish is defined by an overabundance of starch and salt. 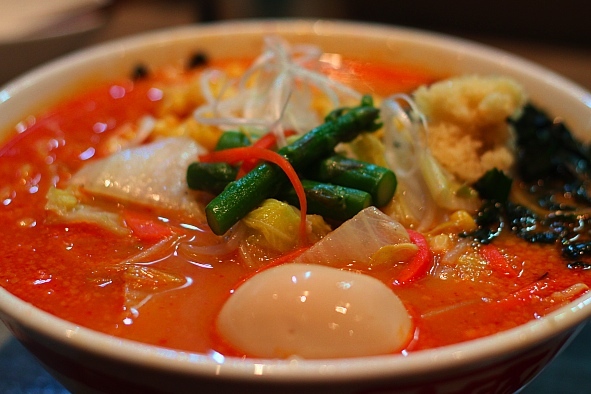 I decide on the spicy garlic ramen ($9.80). The soup's chili spice colours the stock a bright, rusty red and the strips of tender pork shoulder coating the bowl are topped with crisp bean sprouts, onion, scallion and a hefty scoop of freshly grated garlic. The spice adds a very welcome intensity, but the dish is fairly one-dimensional, with the heat and the garlic doing most of the heavy lifting. My companion's bowl of shoyu vegetable ramen ($9.80) is also underwhelming. After a few bites, the broth started to cool and the dish turned out to be rather bland with a tinge of metallic aftertaste. On a more positive note, the hefty serving of well-cooked vegetables and the delicate hard-boiled egg, give the dish a healthy kick and a welcome variety of textures. The spicy vegetable ramen (also $9.80) didn't suffer from any unpleasant aftertaste and was naturally less bland, but I wouldn't call it a show-stopper, either. We went in with high hopes, but left a little disappointed. Perhaps the long wait built our expectations up a little too high. Each of our meals were hearty and warming, and there's certainly no skimping on the meat and vegetable servings. 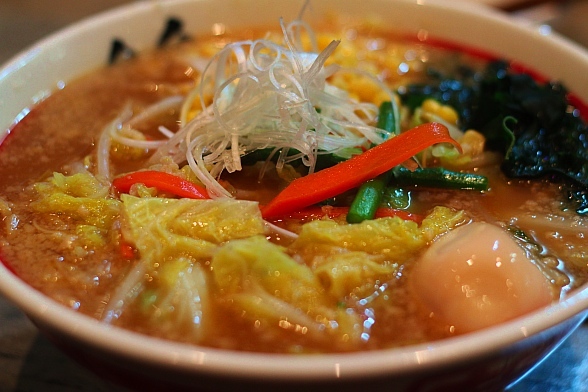 Next time I'm in the neighbourhood and in the mood for noodles, I'd definitely give Kinton Ramen another shot.